Reality almost never lives up to great expectations or formed mental impressions. A decade ago when I came to Hawaii for the first time I was slightly disappointed: it was nothing like I imagined a tropical island would be. Waikiki Beach where we stayed looked like Las Vegas Strip but with an ocean one block away. As much as I like big cities in general and Las Vegas in particular, that felt wrong. But I should have known better when I decided to start my trip from Honolulu, the state capital with one million people population. In three days we moved to a much more tropical (and fitting my imagination) island – Kauai – where we got to appreciate the only good thing about Waikiki Beach that we left – the beach itself where you could easily walk into water and swim. Being a well-known favorite place for windsurfing, most of Kauai’s beaches are too rough for swimming and corals and rocks of the ocean floor make it an injury-prone activity. We got enough nature from those four days on the island where we were moving from one place to another trying in vain to find a beach where we could swim. I didn’t like Kauai much. Whereas it’s hard to repeat a perfect experience it’s much easier to improve something that wasn’t ideal the first time around. Ten years and several visits to other islands later, this year we decided to go to Kauai again. We rented a house on the North shore on Anini Beach that is one of the calmest beaches in Kauai since it’s protected by a large reef. From the bedroom window I could see the ocean and during the day we heard coconuts falling down from palms. There even was an owners’ cat – Money – who visited us making sure I’d get my daily “orange cat fix” – that’s what I call “service”! I’ve experienced the first in my life real tropical rain. It was exactly like it’s usually described in books or shown in movies: a wall of rain falling vertically down and soaking everything within seconds. It was wonderful! And the wildest part of my vacation was a very spotty … WiFi connection, ceiling fans instead of an A/C and a mean wild hen who tried chasing me off the beach park a couple of times. I was scared first but stood up to her in the end and won. It was one of the most relaxed vacations I had in a long time: since during the first visit we couldn’t swim we visited most places recommended to tourists; so this time we spent all our time swimming, reading, talking to friends who were there with us and eating tropical fruits and local fish. Speaking of fruits, what is your most favorite fruit (including berries) to eat and as a perfume note? My answers: mangos I ate in Hawaii (on all islands, not just during this trip) were probably the tastiest fruits I’ve ever eaten. Black currant is currently my favorite berry in perfumery. Give me two fruits, not necessarily tropical, that you like the most (one as food and one as a note or one if it’s the same for both questions) and I’ll use your answers in belated September statistics post where I tell you which eleven perfumes I took with me on this eight-days tropical vacation. This entry was posted in "Four legs good", Random Stuff and tagged Hawaii, Kauai, tropical fruits. Bookmark the permalink. Durians, the king of fruits, and mangosteens, the queen of fruits :) I love my royalty! I’ve tried durian just once and it wasn’t the most pleasant experience. The strange part is that it wasn’t the smell that bothered me but the aftertaste. I’m glad you found a spot where you could swim on Kauai. Swimming in the sea is one of my favourite things to do on holiday. How nice you had your own orange cat too! He looks very cute. Excuse my ignorance but what is that pink fruit in the pic? My favourite fruit is peach to eat. In perfume it would be a toss up between blackcurrant and mango but I think I’ll go with mango as it’s so happy and mouth-watering. Looking forward to hearing which 11 perfumes you packed. I also love swimming in natural water (hate pools!). Warm natural water. The cat was not only cute but very polite. Whenever he came, he hinted that hewouldn’t mind getting something to eat but wasn’t too insistent. And ate fish and cheese that we shared with him. I’ve added caption to the fruit picture. The one you’re asking about is abiu. Not the most interesting fruit I’ve tried but as an experiment it was good enough. Encens Mythique d’Orient is paradise – just not a tropical one. If you can afford it, go anyway. I go from the east coast. Waikiki and Honolulu if you want night life and you can go to the North Shore for the “country” – their term. not mine. My love is Maui, but it pretty much shuts down at 11:00PM. I’ve been there 3 times and each time magic happens! The very air is different in Hawaii! Maui is my favorite island as well. That bowl of fruits, most of which I have never tasted is amazing! My favourite fruit to eat are loquats. and they would probably be my favourite fruit note in perfume but their aroma is very delicate and I have yet to find this note in a perfume. I am not much of a fruit note person but I love the way black currant is used in many MP&G fragrances. As much as I enjoy going to Hawaii for a vacation I think I would get bored quickly if I had to live there (well, I could probably pull a month or two with the crew of Lost ;) ). I haven’t tried loquats yet but I hope that sooner orlater I will. I loved reading about your ‘wildish’ holidays and watching the various sequences of photos – I guffawed as each ‘beautiful but unswimmable beach in Kauai’ hove into view, to be followed by yet one more! Am glad you found a secluded spot that was swimmable, as that is an important part of a beachy type break. Oh, and the photo of the mountain and the lush vegetation looks amazing, as does your rented house, complete with en suite ginger cat! Okay, fruit-wise to eat it would have to be a particular type of Indian mango I get at my local Indian grocer that is unbelievably sweet and juicy. In perfumes it would be fig. ;-) I do also enjoy eating figs (fresh and dried), but mangos win. Interestingly, I was wearing Secret Garden by Mandy Aftel yesterday and wondering what this gorgeous juicy fruit note was and it turned out to be raspberry! – but I wouldn’t say I am a general fan of the note. I was considering fig myself for the perfume note choice but black currant was recently on my mind a lot. Glad you had a good trip! Loved your photos — thanks for sharing! How do you get those neat slideshows into the blog? I’ve only been to Hawaii once, but I loved it. We went to the big island first because I had to see the volcano, and then we spent time on the beach at Maui. Favorite fruit would be a tie between freshly picked olallieberries (though I love all berries) or freshly picked homegrown apricots. In perfume, blackcurrant is probably my favorite. Thank you, Laurie. I liked other islands as well (Maui being probably my favorite) but we wanted to do Kauai once again – and it turned out to be a very pleasant and … different vacation. I am so glad to read of your good time. I hope one day to do the Hawaiian Islands, they sound like fun and offer such a range of holiday experiences. Favourite fruit is Mango, all mangoes but particularly the big spotty ones you get from the Aam Wallah in India from his cart, still warm from the fields and with a taste rarely replicated in the farmed varieties we get in Oz. Second choice Mandarin, I love how easy they are to carry, that they come in a wrapping and when they are good even the smell is enough to make my mouth water. Both of these fruit are good in perfumery, currently I am loving Un Jardin Sur Le Nil, Jacomo #9 and Bombay Bling for their Mango, though the note is there it doesn’t always stand out on my skin above the others. Mandarin in the fragrances I use is usually a background singer like Neroli Portifino and Shalimar but I do like Mandarin by L’Artisan very much. Portia, I so agree with you on mandarines “transportability”! And I love eating them too. Here, in California, we grow one mango variety – Keitt – that is really great but they are usually available just for several weeks in late August – early September. Everything else, store ripe, isn’t worth eating. I bet those several weeks you can get Keitt mangos that you gorge yourself. We are in mango time here right now and it’s a really good year. For eating…I love papaya but only if it is ripe and sweet. As to a fruit perfume note…hard to choose as I like citrus in perfumes but if compelled to pick one, I’ll pick mango (as in Bombay Bling). Hajusuuri, you should definitely go to Hawaii to try local papaya, if for nothing else. 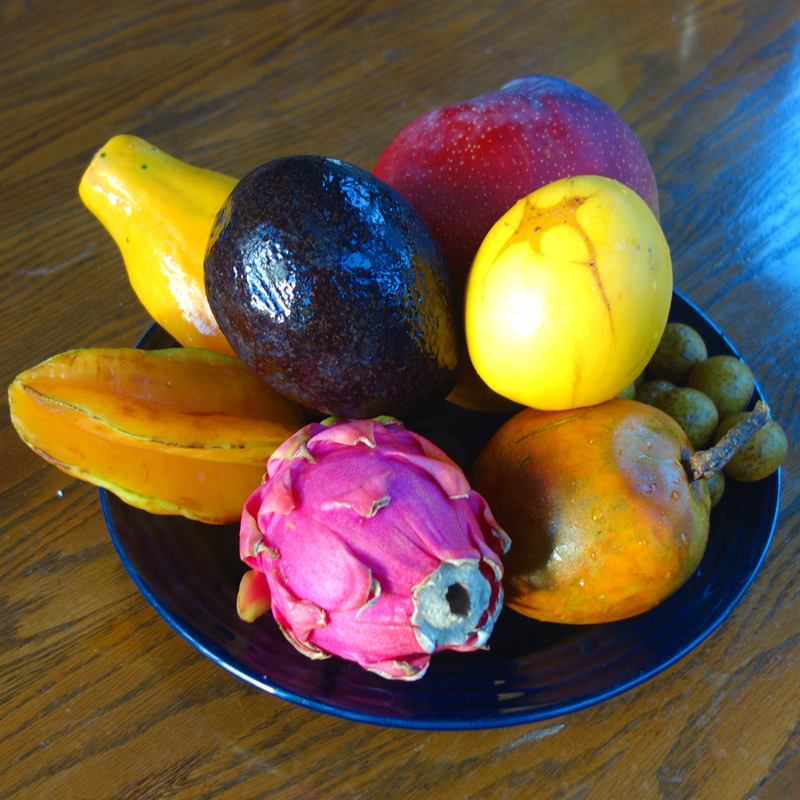 After we had Hawaiian papayas we stopped eating any others (and ripe ones do not transport that well, unfortunately). I would have said mango is my favorite fruit (for eating) but alas, I am unfortunately allergic to fresh mangoes :-( … cooked / preserved ones are ok.
Gorgeous pictures! I am jealous as Hawaii is my dream destination for as long as I can remember (but it is so very far away…). My favorite fruit to eat are raspberries and to smell it would be mango. It is very far from you, I agree. I don’t know how you take a jett lag but for me a day long trip plus the time difference would mean additional 3-4 days needed for the switch. This is one of the reasons we travel to Europe less than we’d like to. Not too many people can afford those extra days just to start enjoying a vacation. But if you ever get a chance to go there – go! You’d like it, I’m sure. Ooh- sounds like a wonderful vacation and your thoughts in italics are spot on..
My favorite fruit to eat probably has to be mangoes in India..few things compare to eating a whole mango in front of the sink with the juices dripping down my arm..messy but yummy. I am not a fan of mango flavors though. Surprisingly when I was in India, I never called mango my favorite fruit..Its almost like however much you like them, not too many people will call beatles their favorite band- it is like a given thing- so accepted that it can be ignored..(not sure if that makes sense)..I used to love eating custard apple in India..and oranges and used to call them my favorites. but yes- my official answer is Indian mango. I really like your Beattles parallel and understand exactly what you tried to say. And you’re the second person who mentions Indian mangos so now I’m curious to try them fresh because untill now I tried them only from cans to make my favorite mango lassi. Oh and the funny thing about mango lassi (which I really like, btw) is that I only heard of it/tasted it in the U.S. It is a U.S thing..:). though you do get mango milkshake and mango ice cream in India..
ok-this mango talk is making me a little sad that I haven’t been in India during mango season for too many years..
Wow, wow, wow, Undina! I didn’t know you went to such a lovely vacation! When I look at all these pictures you’ve included in the post my eyes get bigger and bigger. I’ve never been to any tropical country. I’ve been to couple of Mediterranean ones but they don’t compare. In Italy or Croatia, there are not so many palms and there are not so many species of plants and animals that would be new to me. I’m happy you had a good time? Money is so orange! Glad a cat found you and provided the catty services. Hope Rusty won’t be jealous. And now my answer for the statistics. My favorite fruit as food and for perfume is mandarin orange / tangerine. My favorite fruit strictly for perfume is grapefruit. Good :) I like eating grapefruits, theyare among the first 10 most favorite fruits. I like them in perfumes as well. I feel extremely lucky to be able to travel to Hawaii. Twenty years ago I didn’t even dream about it. Hawaiian fauna isn’t that interesting (if not to consider sea life), mostly animals brought by humans – chickens and cats. But flora is spectacular! I can imagine that Undina! Things have really changed in your life, didn’t they? Yep, they definitely did. And I’m happy about and greatful for that. I have to say, I’m incredibly jealous of your breakfasts. The mango you can buy here is nowhere close to what mango should taste like (I was lucky to try the truly good ones from India so now I know) which is why having it for breakfasts with croissants and coffee sounds like paradise to me (and I’m sure with where you were it did seem so). Which brings me to the fruit. Mango tops my list as the favourite fruit, I’d say closely followed by the fruit I actually do eat often – Granny Smith apples. When it comes to perfumes, I’m not sure which of these I would put at the top of the list, I like them both the same I believe, mango again and fig. I adore fig perfumes. Your Hawaiian experience almost perfectly mirrors my own. I might actually have stayed near where you stayed this time in Kuaui, and I certainly had the same experience as far as lounging at the beach, watching the sun set, and eating amazing fresh fruit. I had reliable wi-fi, though. :) I’m so glad you had a good time and got to relax without electronic interference. As for fruit notes in perfume, you and I are on the same page: black currant at the moment. For eating, I always come back to bananas. I like my bananas mostly in the form of a banana split but Hawaiian apple bananas were good. As a perfume note, black current as in The Enchanted Forest. Undina, that third slide-show series is my favorite – the photo you have labeled “Typical view in Kauai” is just gorgeous – and I loved seeing the house where you stayed (and the big yellow kitty that kept you company). Glad you had such a great experience there this time. Well, let’s hear it for mangoes!! Mango is my favorite fruit to eat, and while I love it in perfume as well, I’m going to go with peach as my favorite perfume fruit note. The cat was an unexpected bonus. I like eating peaches but in perfumes it’s one of my nemeses: I can take it only in very small doses. I haven’t tried mangosteens yet but I will one day. Both my vSO and I love fruits so we’re trying to taste any new ones that we come across. To smell it would be fig and eat, raspberries. Love that you had an orange cat to fill in for Rusty while you were on vacation! Oh how wonderful! Complete with a cat! My favorite fruit is not tropical at all: cherries. I discovered how good they were picking them off a tree in Switzerland. Fruit straight from growing always tastes the best! If it weren’t for mangos I would have named cherries as well! What about a perfume note? I like cherries in perfume as well; that’s part of the reason I like the mass version of La Petite Robe Noire from Guerlain. I’m not sure there’s another fruit note I really die for in perfume. There are some peach perfumes I enjoy, but it’s not like I seek peach out. Same with fig. It’s been over 20 years since The Engineer and I went to Hawaii (2 weeks! It was heaven) but I still have very fond memories. We did Oahu, Kauai and Hawaii, and my favorite was Kauai – I loved the slower pace and lack of development. I’d rather hike or snorkel than swim, so Kauai was a good fit. Favorite fruit for eating is grapes, in perfumery it’s fig. Kauai is great for both hiking and snorkeling, I agree (even though we didn’t do it this time). I was thinking about coconut :) Not sure. But there was plenty of them (and my vSO was constantly worried one of them would fall on our heads ;) ).